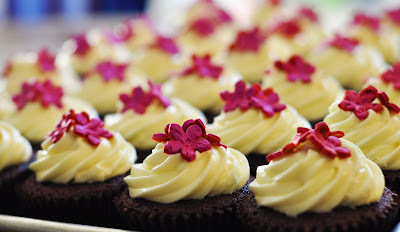 For Jeni's 26th birthday I made her favorite Red Velvet Cupcakes. I honestly have no idea how she's not so totally sick of it by now. I had some red fondant left over from little Max's Elmo cake so I thought it would be a nice touch to have something on top of the cupcakes this time around. These are plastic stamps I bought at Joann. 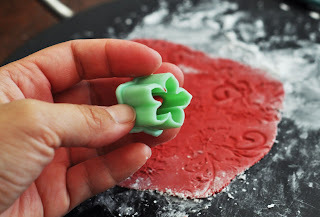 This is a cheap and creative way to add a little flair to your fondant. 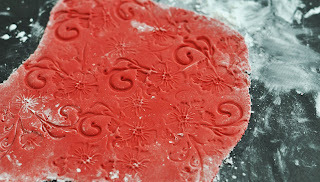 It creates perfect patterns and very easy to do. 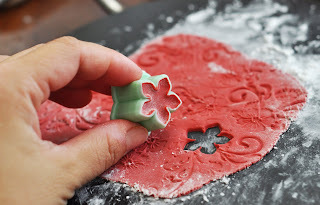 You roll out the fondant pretty thin by using cornstarch and a rolling pin. Then you press the stamp in making sure not to move around as you press down. 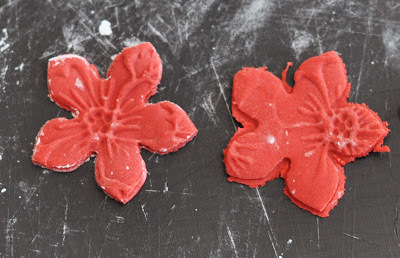 Make sure the stamp and the fondant has a thin layer of cornstarch on it. Otherwise, it will stick and it WILL be messy. 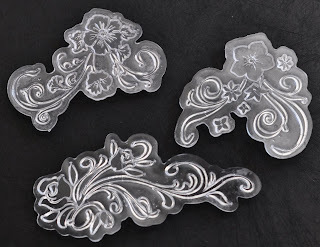 Proceed with the rest of the fondant. Take your cutter, a flower in my case, and start cutting out your shapes. But make sure to press as hard as you can and then wiggle the cutter around so that there are no little "feet". Left one is pretty clean. The right has "feet" and does not look nice. 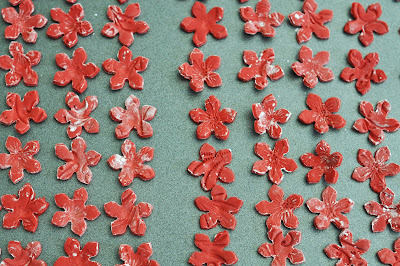 There will be some cornstarch left on the flowers. So I used a small paint brush to dust it off. I wasn't satisfied with leaving it like this so I added some extra bling. This is called Luster Dust. It comes in various colors and shades. 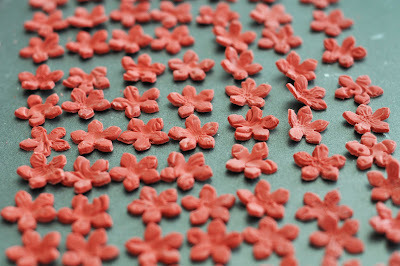 These are used primarily to color sugar flowers. 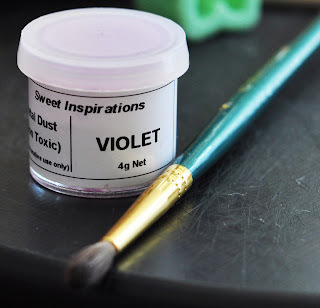 When you add some of this to alcohol (pure extracts are generally used, I use lemon or almond because it's clear) it acts as a kind of paint. 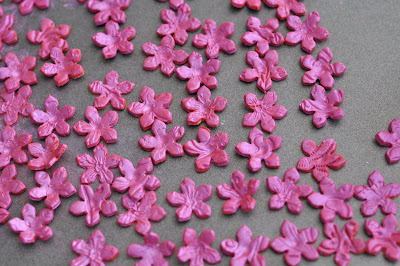 After the flowers are dried, you paint with this and the alcohol evaporates and the shimmery color remains. The ratio of luster dust to alcohol is always tricky. Too much liquid then the color doesn't go on very well. Not enough liquid then it becomes like a paste. It takes a few tries before figuring out the right balance. My tip is just to start off small. 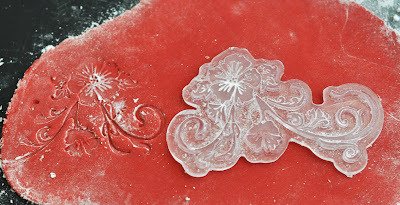 A few drops of extract to 1/8 teaspoon luster dust. Just keep adding until you get the results you want. 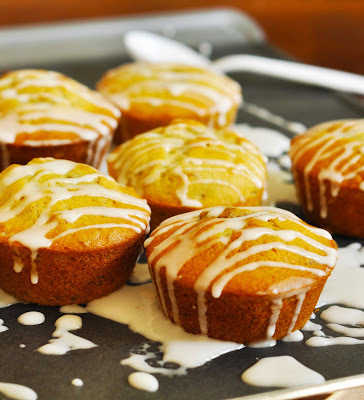 The best banana muffin I've come across thus far are Emeril Lagasse's Banana Muffin Recipe. It's super easy and pretty yummy. 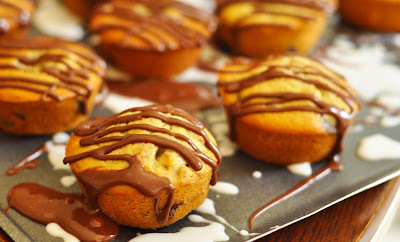 It's originally baked in a loaf pan but I made muffins so that it would bake faster. 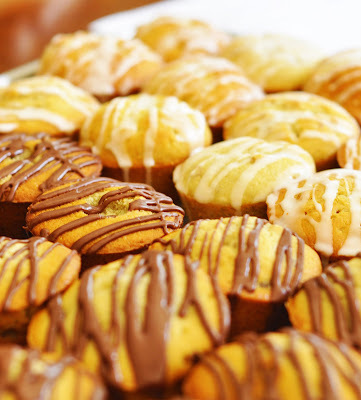 The recipe yields about 20 muffins. I added chocolate chips to about 1/2 the batter. For the icing on top, all it is is powered sugar and water. There's no exact recipe for this either. I just start of with a little water (seriously, maybe a few tablespoons) then slowly keep adding powered sugar until it gets pretty thick. 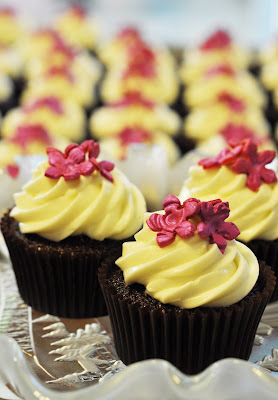 The more water, the thinner and runny the icing. Sounds obvious but it took be a while before I could get it to the consistency I wanted. For the chocolate icing, I just added some cocoa powder. But you could do chocolate ganache as well. I just didn't have heavy cream.